Complete elimination and prevention of bacteria from the root canal system is an essential element for the successful endodontic treatment. However, it has been shown that, even after meticulous root canal instrumentation, thorough root canal disinfection, and obturation, bacteria still persist in the root canal system; thus, it is essential to develop advanced endodontic disinfectant strategies to eliminate the bacteria and prevent persistent or reinfections. Enterococcus faecalis is commonly associated with persistent periradicular lesions. It possess certain virulence factors which makes it the most resistant microbe such as cytolysin, lytic enzymes, aggregation substance, pheromones, and lipoteichoic acid. E. faecalis has the ability to invade dentinal tubules and cementum. It resists most of the root canal disinfectants and survive longer periods in dentinal tubules even in nutrient depleted conditions in an obturated canal and lead to persistent or reinfections., Therefore, newer approaches to control such resistant microbes have to be developed. Various nanoparticles (NPs) have been used as root canal irrigants and intracanal medicaments., NPs possess the unique mode of action, exhibit potent antimicrobial activity, and provide a long-term and effective treatment at the site of infection at much smaller doses. Among various NPs, silver NPs (AgNPs) possess broad spectrum of activity and are biocompatible. However, the synthetic nanoparticles possess certain drawbacks such as high cost, chemicals involved in synthesis, and produce toxic chemicals causing hazards to human health and environment. Therefore, biosynthesized AgNPs have emerged alternative to synthetic nanoparticles which are as effective as existing antimicrobial agents. Fungi possess several advantages over other microorganisms for biosynthesis of AgNPs such as they need simple nutrients for growth, cost-effective, and simple process involved, possibility of development of reliable processes for AgNPs with good monodispersity, size, and chemical composition, therefore, considered as naturally occurring nanofactories., Several studies have been reported for application of synthetic AgNPs for endodontic therapy;,, however, no reports are available regarding the application of biosynthesized AgNPs as antibacterial agents against E. faecalis. The aim of the current study is to evaluate the antibacterial efficacy of fungal-derived AgNPs against E. faecalis. AgNPs were biosynthesized using the endophytic fungi as described in earlier study. Briefly, AgNPs were produced biosynthetically using fungi isolated from the fresh leaves of Withania Somnifera (Ashwagandha). The fungi were identified based on microscopic and morphological features as Fusarium semitectum. 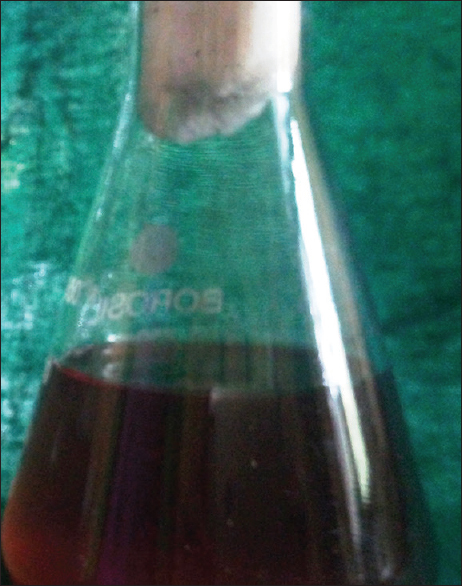 The isolated fungi were inoculated in malt glucose yeast peptone broth at 28°C for 72 h. The filtered biomass washed using distilled water and then transferred into flasks containing 100 ml of distilled water and incubated for 48 h. The filtrate was mixed with aqueous solution of silver nitrate of 1 mM concentration, thus get reduced and show the color change from colorless to reddish-brown producing the AgNPs. The biosynthesized AgNPs were characterized by visual observation, ultraviolet-visible spectrophotometer, high-resolution transmission electron microscope, selected area electron diffraction analysis, and Fourier transform infrared spectroscopy for better understanding the nature of AgNPs were used to study the antibacterial efficacy against E. faecalis in the current study [Figure 1]. E. faecalis strains (ATCC-29212) (American Type Culture Collection, Manassas, VA, USA) were used for the study. Bacteria were subcultured from the stock culture on trypticase soy agar (TSA) plates incubated at 35°C for 24 h. The colonies were confirmed by Gram staining. Inoculum was prepared by transferring the colonies from the TSA plates with a sterilized inoculation loop to the trypticase soya broth and incubated for 6–7 h. The density = 0.5 McFarland constant was adjusted to 1.5 × 108 CFU/mL. 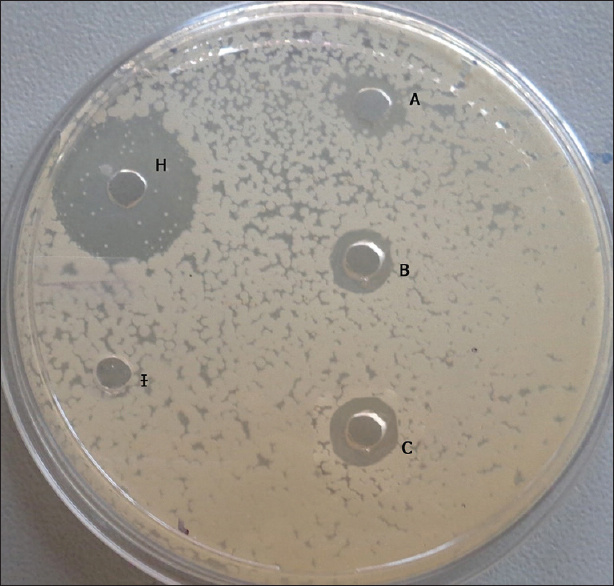 Antibacterial efficacy against E. faecalis was evaluated by agar well diffusion method according to Clinical and Laboratory Standards Institute guidelines. Biosynthesized AgNPs of different concentrations 20, 40, 60, 80, and 100 μl. Chlorhexidine digluconate (CHX) of 0.2% and 2%, ampicillin, and sterile distilled water were used as antibacterial agents. 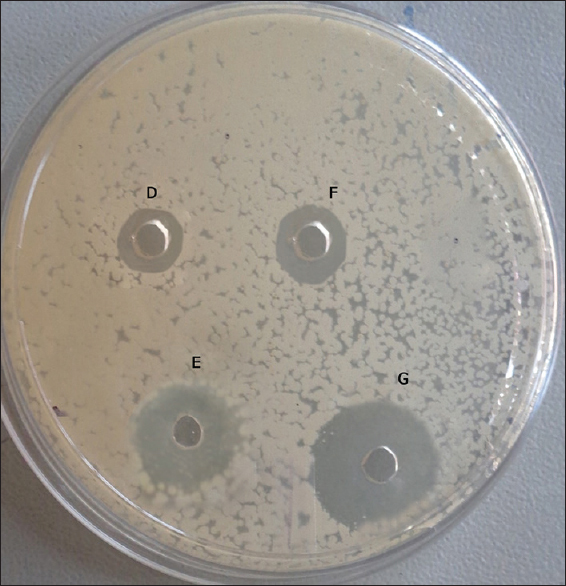 E. faecalis strains were evenly swabbed on the solidified 20 ml of Mueller-Hinton Agar plates using a sterile swab (HiMedia, Mumbai, India.) rotating the plates around 60° in between streaking for even distribution. Using a sterile punching device, wells of 5 mm diameter were prepared in the agar plate. A (20 μl), B (40 μl), C (60 μl), D (80 μl), and E (100 μl) of AgNPs, F (0.2% CHX), G (2% CHX), H (ampicillin), and I (sterile distilled water) were added into the respective wells. The Petri plates were incubated for 24–48 h at 37°C. The experiment was carried out in six replicates for each agent used. The plates were read only when the lawn of growth was confluent. Vernier calipers were used to measure the diameter of inhibition to the nearest whole millimeter and the data were tabulated. AgNPs exhibited effective antibacterial efficacy. AgNPs E (100 μl), D (80 μl), C (60 μl), B (40 μl) and A (20 μl) showed zones of inhibitions of 19.55 mm, 18.37 mm, 15.4 mm, 13.59 mm and 10.32 mm respectively. Chlorhexidine 2% and 0.2% showed 20.02 mm and 14.52 mm. 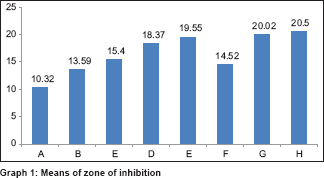 maximum inhibition zone was seen for control group H (Ampicillin) with 20.5 mm and no zones for I (sterile distilled water) [Figure 2] and [Figure 3]. One-way ANOVA (P< 0.0001) and post hoc Tukey multiple comparison test shows no significant difference between E (AgNPs 100 μl) and G (CHX 2%) and between G (CHX 2%) and H (ampicillin) indicating AgNPs are as effective as 2% CHX against E. faecalis [Table 1] and [Graph 1]. E. faecalis produces the collagen-binding proteins such Adhesin, Ace, and serine protease, which help to adhere to collagen present in dentin and cementum.,E. faecalis survives even after meticulous root canal instrumentation, irrigation, or intracanal medications and can penetrate root dentin and even cementum.,E. faecalis has the ability to form biofilm and survive even in the presence of intracanal medication.E. faecalis present in biofilm is more resistant to antibacterial agents. AgNPs have been employed for root canal disinfection. Wu et al. evaluated antibacterial efficacy of AgNPs in gel and solution form as irrigant and intracanal medicament against E. faecalis and reported as AgNPs gel form are more effective as irrigant. Dong et al. 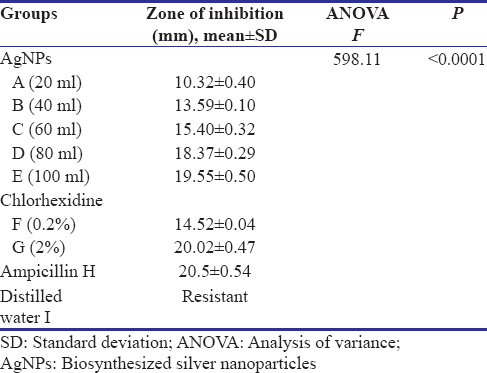 reported 0.1% and 0.2% nanosilver gel is more effective on E. faecalis biofilm compared to other disinfectants such as CHX and camphorated phenol. However, no studies have been reported employing biosynthesized AgNPs derived from fungi as antibacterial agents against E. faecalis. The current study aims at evaluating antibacterial efficacy of biosynthesized AgNPs against E. faecalis. Chlorhexidine gluconate is most recommended antimicrobial agent for root canal disinfection owing to its substantivity effect and low toxicity. It is bacteriostatic at lower concentrations (0.2%) and bactericidal at higher concentrations (2%), and hence used as a positive control group in the present study. Results of the current study show that biosynthesized AgNPs have effective antibacterial efficacy as 2% CHX against E. faecalis showing highest zone of inhibition of 19.55 mm (100 ml AgNPs) and lowest zone of 10.32 mm (20 ml) indicating can be effectively used as alternative antimicrobial agent for endodontic disinfection. Positive control ampicillin shows maximum zone of inhibition of 20.5 mm. Results of our study show highest zone of inhibition for 2% CHX (20.02 mm) compared to 0.2% CHX (14.52 mm). Agar well diffusion method has been commonly employed for studying antibacterial efficacy against microorganisms., However, factors apart from the actual antibacterial activity of the agents tested might affect the accuracy and reproducibility of agar well diffusion method such as, diffusion and solubility of the antimicrobial agent through the agar medium, thickness of the gel, viscosity of the agar base, storage conditions of agar plates, incubation time, and methods employed for application. However, further in vitro and in vivo studies employing different techniques should be carried out for the effective use of these nanoparticles for endodontic disinfection. Biosynthesized AgNPs emerge as novel antimicrobial agents for endodontic disinfection with effective antibacterial efficacy against most resistant endodontic pathogen E. faecalis. Siqueira JF Jr., Rocas IN, Ricucci D. Biofilm in endodontic infection. Endod Top 2010;22:33-49. Kishen A. Advanced therapeutic options for endodontic biofilms. Endod Top 2010;22:99-123. Rôças IN, Siqueira JF Jr., Santos KR. Association of Enterococcus faecalis with different forms of periradicular diseases. J Endod 2004;30:315-20. Halkai R, Hegde MN, Halkai K. Root cementum invasion and adhesion by Enterococcus faecalis confocal analysis. NUJHS 2012;2:44-9. Halkai RS, Hegde MN, Halkai KR. Evaluation of Enterococcus faecalis adhesion, penetration, and method to prevent the penetration of Enterococcus faecalis into root cementum: Confocal laser scanning microscope and scanning electron microscope analysis. J Conserv Dent 2016;19:541-8. Shrestha A, Shi Z, Neoh KG, Kishen A. Nanoparticulates for antibiofilm treatment and effect of aging on its antibacterial activity. J Endod 2010;36:1030-5. Pagonis TC, Chen J, Fontana CR, Devalapally H, Ruggiero K, Song X, et al. Nanoparticle-based endodontic antimicrobial photodynamic therapy. J Endod 2010;36:322-8. Mohanpuria P, Rana NK, Yadav SK. Biosynthesis of nanoparticles: Technological concepts and future applications. J Nanopart Res 2008;10:507-17. Halkai KR, Mudda JA, Shivanna V, Rathod V, Halkai R. Biosynthesized silver nanoparticles from fungi as antimicrobial agents for endo-perio lesions – A review. Annu Res Rev Biol 2016;10:1-7. Halkai KR, Mudda JA, Shivanna V, Rathod V, Halkai R. Biosynthesis, characterization and antibacterial efficacy of silver nanoparticles derived from endophytic fungi against P. Gingivalis. J Clin Diagn Res 2017;11:92-6. Mukherjee P, Ahmad A, Mandal D, Senapati S, Sainkar SR, Khan MI, et al. Fungus mediated synthesis of silver nanoparticles and their immobilization in the mycelia matrix. A novel biological approach to nanoparticles synthesis. Nanoletters 2001;1:515-9. Sader HS, Flamm RK, Jones RN. Antimicrobial activity of daptomycin tested against gram-positive pathogens collected in Europe, Latin America, and selected countries in the Asia-Pacific region (2011). Diagn Microbiol Infect Dis 2013;75:417-22. Rahul H, Mithra HN, Kiran H. Penetration of E. Faecalis into root cementum cause for reinfection. Annu Res Rev Biol 2014;4:4115-22. Svensater G, Bergenholtz G. Biofilm in endodontic infections. Endod Top 2004;9:27-36. Chavez de Paz LE. Redefining the persistent infection in root canals: Possible role of biofilm communities. J Endod 2007;33:652-62. Hubble TS, Hatton JF, Nallapareddy SR, Murray BE, Gillespie MJ. Influence of Enterococcus faecalis proteases and the collagen-binding protein, ace, on adhesion to dentin. Oral Microbiol Immunol 2003;18:121-6. Halkai R, Hegde MN, Halkai K. Enterococcus faecalis cause for persisting infection a confocal analysis. NUJHS 2013;3:67-72. Bo D, Kayombo CM. Effect of nanosilver gel, chlorhexidine gluconate, and camphorated phenol on Enterococcus faecalis biofilm. Int Sch Res Notices 2014;2014:380278. Balaji BS, Lagashetty DA, Rajasab AH, Venkataraman A. Extracellular biosynthesis of silver nanoparticles using the fungus Fusarium semitectum. Mater Res Bull 2008;43:1164-70.